Van der Poel wins in a faultless performance while Van Aert fights back from early crash to take second. Mathieu van der Poel (Corendon-Circus) made it look easy in the setting sun and sand dunes of Koksijde. He took the lead within five minutes, built a huge gap in the first half of the race, and was able to ease off the gas to enjoy the final laps in comfort Sunday. Van der Poel took the holeshot, with Lars van der Haar (Telenet Fidea Lions) tight on his wheel, and a select group including Quinten Hermans, Corne van Kessel (both Telenet Fidea Lions) Wout Van Aert, and World Cup leader Toon Aerts (Telenet Fidea Lions) close behind. 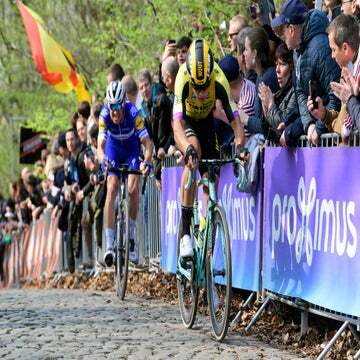 World champion Van Aert crashed early in the lap on a sandy bank, losing momentum and time. As soon as halfway through the opening lap, van der Poel had built a 10-second lead, growing this to 15 seconds as he crossed the line for lap two. The chase was led by Van der Haar, with Van Kessel and Aerts a few seconds behind him. Van Aert steadily regained the time he lost to his earlier mistake and made contact with Van Kessel and Aerts toward the end of the lap. By lap three, van der Poel was over 20 seconds in the lead, with Aerts second, and Van Kessel, Van Aert, Van der Haar and Daan Soete (Pauwels Sauzen-Vastgoedservice) soon behind him. Van der Poel was racing confidently yet aggressively at the head of the course, constantly gaining time, looking totally in control as he guided his bike through the sand, always looking fully composed. Van Aert was leading the chasers by lap four, 38 seconds behind the leader, with series leader Aerts immediately behind. The world champion did not look pressured after his unfortunate start and rode smoothly, however, he was unable to gain time on the leader. Van der Poel’s handling and form was imperious, and he posted the fastest lap of the race so far on lap four. As the race wore on, Van Aert slowly started to distance Aerts, and the race stretched out, with gaps appearing throughout the top eight. Behind Aerts came Van der Haar, Van Kessel, Soete, Laurens Sweeck (Pauwels Sauzen-Vastgoedservice), and Michael Vanthourenhout (Marlux-Bingoal). 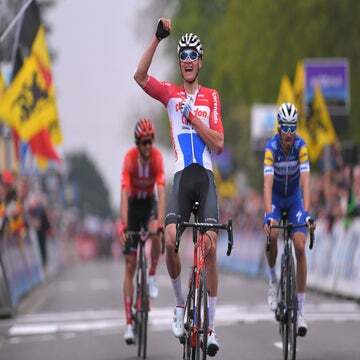 By lap eight, Van Aert had kept van der Poel at 36 seconds, though this appeared mainly due to the leader’s easing in pace as he sensed his dominance over the field. Aerts was 15 seconds further back. van der Poel continued to ride more steadily through the final lap of the race, taking the opportunity to showboat for the huge crowds. Van der Poel went on to win in 1:04:13, with Van Aert 25 seconds back, and Aerts 23 seconds behind him, retaining the World Cup leader’s jersey with his third place.